On January 1st, 2013, I started a new diet that I thought would help me lose some weight and be more accountable for what I eat. I had tried calorie counting apps and programs before, but they were really difficult for me because it took so much effort to calculate and log what I ate. I believe this new diet will have the same impact, but with much less effort (and a lot more fun)! I've already lost 10 lbs. on this diet and I fully expect to lose a lot more! It adds just the right amount of friction and pause to every inkling of hunger. It takes a few seconds to stop and take a photo of something before you pop it into your mouth. That pause allows you to ask yourself questions: Am I actually hungry? Is that snack to going to satisfy me? Do I want to publicly post on instagram that I ate that junk food? In addition, it makes you plan your meal before you start eating. Instead of mindlessly eating from an extra large bag of potato chips or continuing to graze off a family-style dinner plate, you have to consciously decide and portion off what you are going to eat so that you can photograph it. Soon, you learn that one plate of food is more than enough to satisfy you. And if you're still hungry, again, you have to take another photo to show what else you ate for that meal. This diet method works because it makes you think before you eat. And yet it's super simple: there is no calorie counting math, there are no restrictions against your favorite foods. All you have to do is snap a photo with your Instagram app. 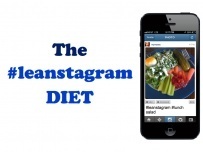 I hope you all join me on the #Leanstagram diet!